Lizzie will not go out the back door on a rainy day, but sprints off into the wet spray of the salty ocean waves, soaking her legs and belly. I think that this is about flat out time. Pup caroused with Lucky, both dogs pausing momentarily to adjust the lead dog position in the game, and then raced off kicking up sand. Oregon beaches are the most photographed of the United States. Had I been a professional photographer, I would be flat out pleased. Even on a lightly foggy day the beach views were enticing. 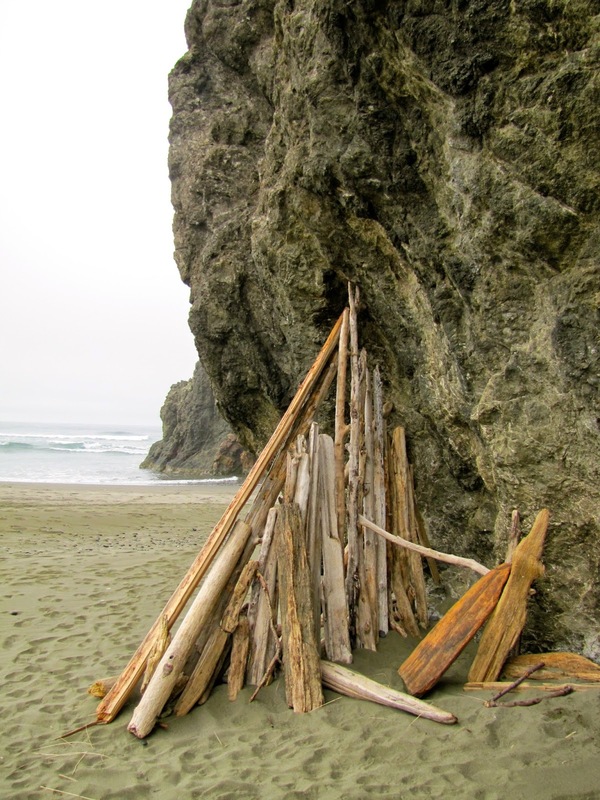 As the dogs ran loops, Carol and I gathered stones and explored driftwood architecture. We all have visions of I could live here, right here on the beach. I thought about a nice wrapping of canvas on this tent structure avoiding that odd shade of turquoise that is so common with plastic tarps. I miss canvas. 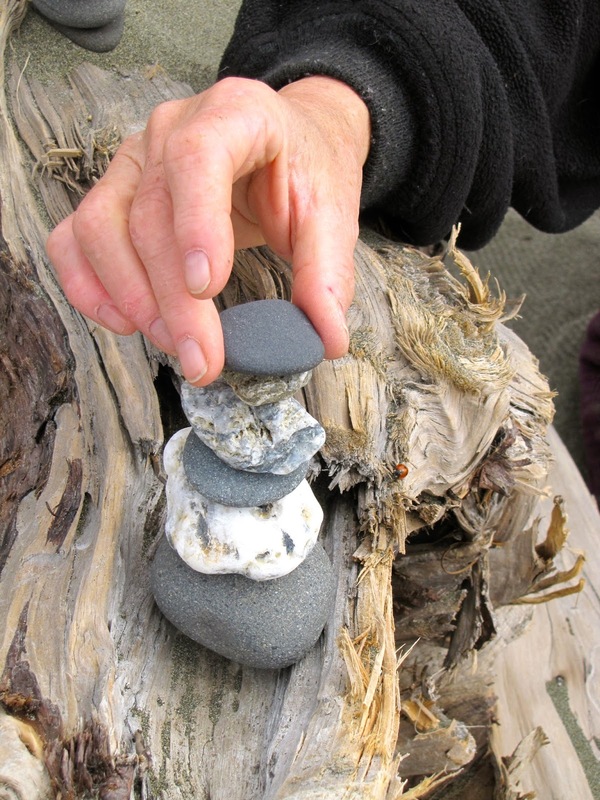 As the dogs continued to whirl around us, Carol built rock structures. She is learning photography skills, so I got to have a beach picture of pup and I. Nice job, Carol! We wandered until it was obvious our camp arrival would have to be in the dark; so instead of cooking by headlamp, we looked for a seafood restaurant for dinner. Coos Bay on a Sunday only had one place open that was easy to spot, The Blue Heron. The warm wood-lined dining room advertised seafood, but its specialty was German food. The young owner recommended that we split a meal and to be honest, it was hard to choose which one. We ordered saurerbraten with red cabbage, root vegetables and herbed mashed potatoes. All of the food was made in house. If I lived in this town, I would eat here often. Before leaving the owner suggested dessert and we bought three of them! 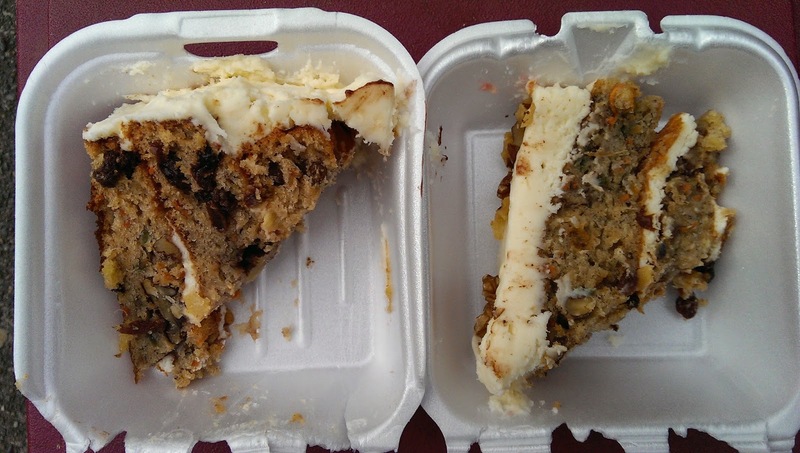 The carrot cake was the best that I have ever had (one bite told us this), so we ordered two pieces and one slice of chocolate walnut torte to go. Once set-up in camp we walked to the Umpqua Lighthouse with its jewel like red and white beacon lights. I have seen it in the daytime last spring, but never at night. The darkness masked the steep hills to the lighthouse, or Carol might not have agreed to the hike. I returned to the camp to get my camera, happy to walk off calories over a couple of miles on two round trips. The light was worth it. Of all of the memories on this trip, this might be the one that lingers, a gem among the sailor's sky of stars. 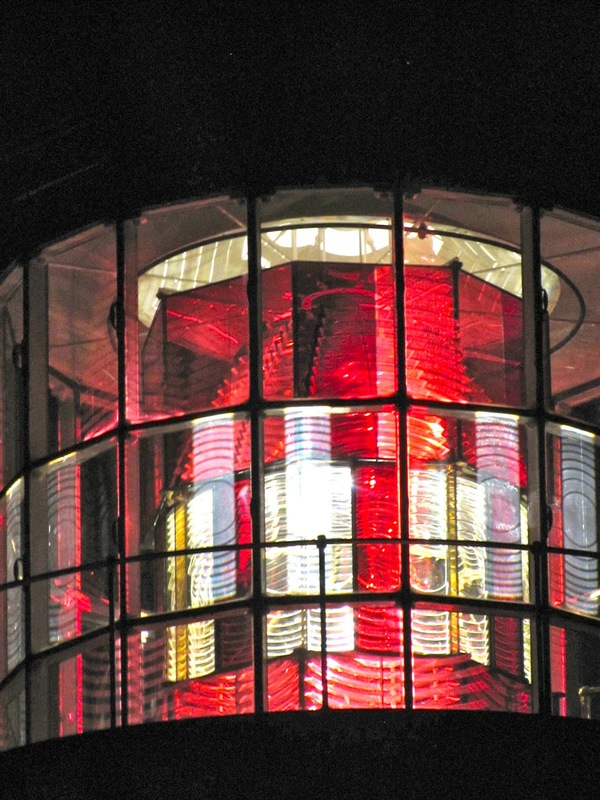 The light house is mesmerizing.